Buy yourself a touch of refinement with a pocket watch. 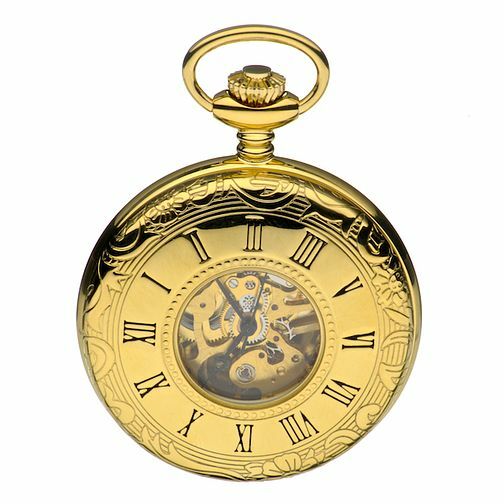 This pocket watch is beautifully crafted in brass, and a glass cover displays the inner workings. Skeleton Pocket Watch is rated 5.0 out of 5 by 2. Rated 5 out of 5 by Anonymous from excellent value This was a gift for my line manage, everyone liked it, definitely is a nice jewelry to wear for people who like the style from the 70s. Rated 5 out of 5 by cgriff from Looks great This item is well priced for what it is, don't be fooled by the colour it is in the picture looks silver but is gold. Was absolutely chuffed with the item, bought it as a present for my father he thought it was great.